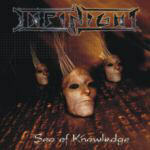 Now it always is a little awkward, if a CD released in 2005 reaches me in 2008 for reviewing, because I have no idea, if the band still sounds the same or what, but here we are with INFINIGHT’s “Sea Of Knowledge” CD, which fared exactly that fate. So far it’s been the last release for the quintet, so maybe it is to rekindle some interest in them prior to something new, I don’t know, but let’s see what the quintet has to offer. They’ve been around since 2001 and their weapon of choice is a little rougher Power Metal, sometimes referred to as Power/Thrash Metal, but with the exception of the vocals being a little less clear and the guitars maybe being a little heavier, I don’t detect much Thrash in there, but that doesn’t matter, on to the music and that is a rather two-edged sword to me. There is a bunch of songs on “Sea Of Knowledge” that grip you and get you going, but then there are other tracks that kind of leave me hanging a little, which is a little disappointing, because when INFINIGHT get going, they really get going! Opener “The Swarm” is a nicely catchy, mid-paced opener, which is not outstanding, but gets the job done. “The Downward Spiral” is a different story altogether, straighter, faster, with cool bridge and chorus and good drive, with the exception of Martin Klein’s voice almost seeming like scratching its limit a little here and there this is a true firecracker! The next two highlights follow with the title track, which is my personal favourite, with thundering double-bass, sharp riffing and is heavy, melodic, dynamic and memorable, love it! And also “Goodbye, Cruel World” stands out, more mid-paced, with nice guitar work, while “Labyrinth Of Lies” shows good dynamics and closing 8+ epos “Gallery Of Dreams” also offers some nice layering, overall showing a slightly more subdued side of the band. The other songs, though, just don’t manage to capture me as much, while not being bad by any means, I mean, it clearly shows that they are not greenhorns when it comes to songwriting and the instrumental side is flawless, it just doesn’t all measure up the same way. So a worthy effort for the mentioned songs alone, just some extra ballast, which doesn’t weigh down too much, though, as the production also is really good, so at least check them out, they deserve it.